We are engaged in manufacturing, exporting and supplying an assortment of Collar Type Machine with Auger Filler (Model No. - MP - A - 08A). Our range is used for packing of powder and free flowing products wide range of consumer packs with desired filling system. 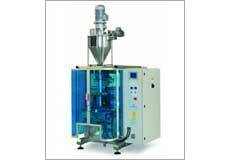 We have designed Collar Type Auger Filling Machines which are efficient for packaging seal pouch. Suitable for all type of heat sealable laminated film, aluminum foil, Bump etc.